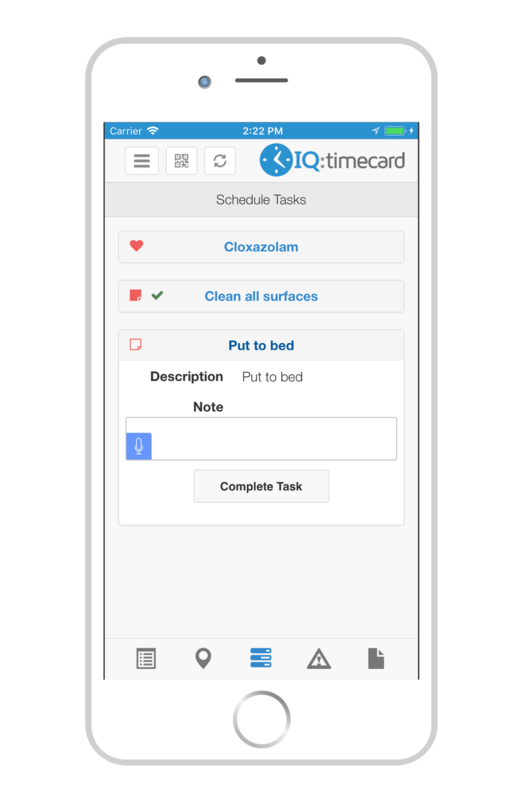 Task, Actions and Medications Launch on our IQ:timecard mobile app. We have launched ‘Tasks, Actions and Medications’ to our IQ:timecard mobile app. Before an employee arrives at a scheduled appointment you are able to set them a list of tasks to complete from either your IQ:careplanner or IQ:timecard account. These will then be sent directly to the employees IQ:timecard mobile app for them to browse and complete on their visit. Tasks can range from medication administration to general day-to-day jobs such as making the bed, meal preparation etc. The employee is able to check the tasks off once completed and also add any comments if required. The information submitted by the employee is then sent back to your IQ:careplanner account, in real time, for you to browse and keep for your clients records. Not only does this cut down on costs with paper and admin time, but it enables both the office staff and the employee to be efficient. The employee also has more time to spend with the client as they aren’t having to fill forms out manually.